A report commissioned by the UK MNO trade association has concluded that delaying the rollout of 5G could cost the economy £6.8 billion. Mobile UK commissioned research firm Assembly to take a look at the implications to the UK mobile market, and its economy in general, of restricting the use of Huawei gear in the rollout of 5G networks. The headline findings are that it could delay the widespread availability of 5G by up to two years, which in turn would cost the country up to £6.8 billion in lost opportunities. The numbers were produced in cooperation with all four UK MNOs, but also drew upon the government’s own projections. The reason for the report is the Telecoms Supply Chain Review currently being conducted by the government, which could end up not only restricting the use of Huawei gear in the 5G network, but compelling the replacement of some kit already in the wild. Assembly reckons even a partial restriction would delay widespread 5G deployment by 18 months and a full restriction would stick an extra six months onto that delay. A major complicating factor is that much of the 5G network will be built on top of the 4G one, so a laborious and expensive replacement process would be required. 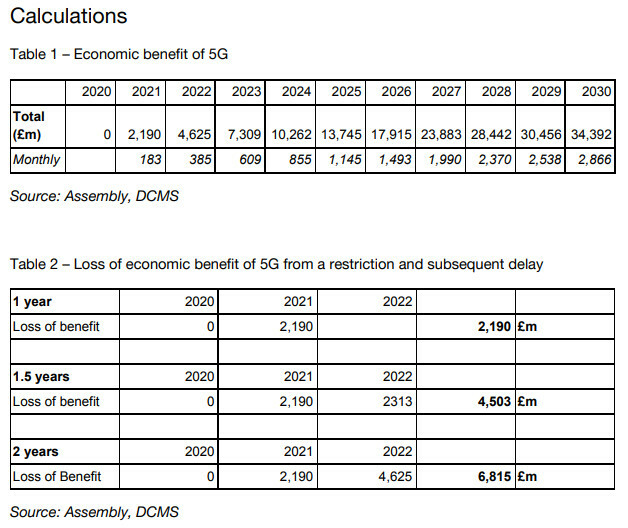 In the tables below you can see what Assembly reckons the economic benefits of 5G will be to the UK economy from 2020 to 2030. For some reason they haven’t chalked up any ROI for 2020 but you can see how they got to their £6.8 billion figure if you write off the first two years of 5G economic goodness. If we assume the report was designed, at least in part, to make the case that restricting the use of Huawei gear would inflict significant harm on the country then the position of UK MNOs seems to be clear. The report says UK operators are currently using Huawei in a significant percentage of their networks and a ban that required them to replace it before they could roll out 5G would be very expensive and time consuming. In short, UK MNOs don’t want a Huawei ban.